October is National Dental Hygiene Month. This month of recognition is an opportunity to celebrate the work that dental hygienists do as well as raise awareness on the significance of good oral healthcare. Oral hygiene is often overlooked, but it can affect your overall health as well. 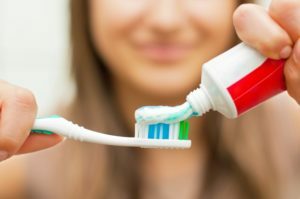 Read on to learn the importance of good oral hygiene and how to maintain a proper oral health routine for the best looking and feeling smile! Why is Good Oral Hygiene Important? In recent years, there’s been an increased interest in the link between your oral hygiene and your overall health. Besides your mouth looking and feeling unhealthy, your oral hygiene can actually affect the rest of your body. For example, people with serious gum disease are 40% more likely to have an additional chronic condition on top of it. Furthermore, gum disease increases your chances of having diabetes and heart disease. 91% of patients who have heart disease also have periodontitis (gum disease). Many people look at your mouth as the gateway to the rest of your body. If you have a clean and healthy-looking mouth, people will perceive you as younger, healthier, and more self-confident. Brush your teeth twice a day using a soft-bristled toothbrush. Be sure to brush all sides of your teeth and brush your gumline at a 45-degree angle to clean out any harmful bacteria. You should pick the size and shape of your brush based on how well it can fit in your mouth and reach all areas with ease. Floss your teeth once a day to clear out any plaque and food debris from in between your teeth. This is an essential part of taking care of your teeth and gums because it removes bacteria that couldn’t be cleaned by a toothbrush. Did you know your teeth alone account for less than one half of your mouth? Rinsing your mouth with water or mouthwash can help eliminate bacteria leftover from brushing and flossing. It may also help reduce your chances of tooth decay and infection. You may have never guessed it, but your dentist in Carrollton recommends chewing gum! Well, only chewing sugar-free gum. Chewing sugar-free gum for 20 minutes after meals can help reduce tooth decay. The gum increases your saliva flow, which washes away food and other debris and neutralizes acids caused by bacteria. Now that you know how to keep up with good oral healthcare, you can celebrate National Dental Hygiene Month the right way! Turn these 4 recommended parts of your oral healthcare into healthy habits to keep your pearly whites looking and feeling great. Dr. Rajiv Shekhadiya and Dr. Dhiren Ahir are dentists who are dedicated to providing care for the whole family in Carrollton. They both attend continuing education courses to stay up-to-date on all the latest and greatest techniques in dentistry. They currently practice at Celebration Family Dental, where they can be contacted through their website or by phone at (469) 892-6647 for any questions.